Please use this revised Syllabus Template for the 2017-2018 academic year. The concept of a course syllabus (Syllabus Template) has changed over the past years from a statement of course content to a much more formal contract with the student, wherein college policies and instructor expectations have to be spelled out in much greater detail. 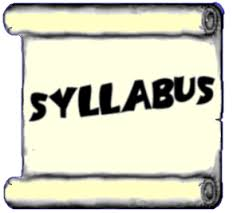 In order to give our students accurate and current information, we have created this tool to assist instructors with syllabus preparation. This Syllabus Template provides faculty with the information needed to write a complete and comprehensive syllabus. Calendars for the term are also provided. Statements from the various campus areas are updated regularly by those who created them, so be sure to check each year for new updates, which usually occur in early June.